Summer – and the fast approaching holiday season – presents many opportunities to spend time with friends and family. It is also a great time to consider cosmetic dental treatments. After all, you want to be looking your best for the summer festivities! Teeth whitening remains one of the easiest way of cosmetic dental treatments and fastest ways to achieving a more attractive looking smile. It is easy to see why it has grown into a billion-dollar industry in recent decades. Most people associate yellowish or stained teeth with negative traits like bad oral or personal hygiene, laziness and even messiness. 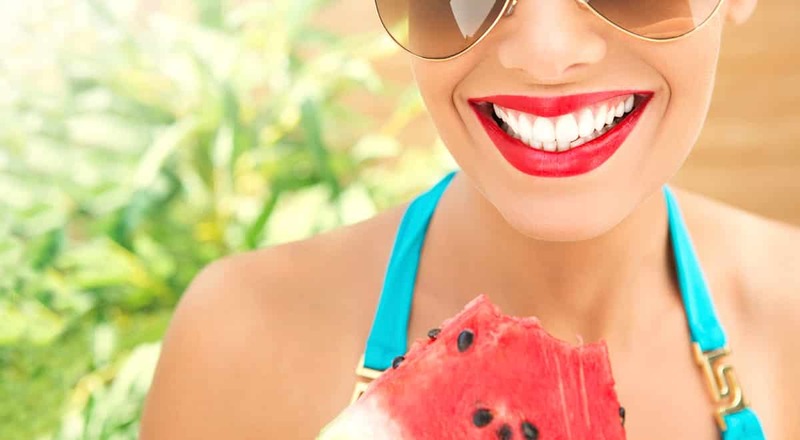 Indeed, stained teeth can convey negative impressions in often indirect and subtle ways. Conversely, teeth whitening not only brightens up your smile, it erases the ugly teeth stains that many people find off-putting. New and improved teeth whitening systems like Zoom can even lighten your teeth up to eight shades in as little as 45 minutes. Depending on the condition of your teeth and extent of your discolouration, new and improved systems like Zoom, you can lighten your teeth up to eight shades in as little as one hour. The professional laser whitening system uses a higher strength whitening agent that delivers faster and more effective results. That’s because cosmetic dentists are authorised to use higher concentrations of he bleaching agent as well as a proprietary light source to catalyse the whitening process. Laser whitening therapies takes a single dental appointment to achieve what would normally take OTC home whitening products many days or weeks. Do you have stained, crooked, gappy, or chipped teeth? Dental veneers can offer you a fast and effective cosmetic dental treatment option to hide those dental flaws that you thought were impossible to get rid of. Dental veneers consist of thin porcelain laminates that are bonded to your teeth to cover your dental imperfections in a way that is aesthetic and natural looking. In just one or two dental appointments, dental veneers can transform your teeth by making them look whiter, straighter and more proportionate. For all its versatility, it must be said that veneers are not for everyone. While they do an amazing job of enhancing the appearance of your teeth, they do not restore the health and functional quality of your teeth. So if your teeth don’t look as great as you would like but are still in good shape, dental veneers may be your treatment of choice. Cosmetic facial injectables are used primarily to remove lines and wrinkles such as frown lines and crow’s feet (around the eyes) and to plump up the volume of lips and remove lines and wrinkles. Cosmetic Facial Injectables: Counter Signs of Old Age! Perhaps the least known cosmetic treatment that a cosmetic dentist can provide is cosmetic Facial Injectables. Cosmetic facial injectables involve administering a micro-needle into or around facial muscles. Depending on the area covered, it may be repeated as often as desired – each session typically takes less than 10 minutes. The treatment is used primarily to remove lines and wrinkles such as frown lines and crow’s feet (around the eyes). They are also popularly used to plump up the volume of lips and remove lines and wrinkles. There are many advantages to getting your facial cosmetic treatments done at a dental practice. There is the obvious benefit of having these therapies administered by a licensed practitioner in a safe clinical environment. The dexterous clinical skills of cosmetic dentists, combined with their intimate knowledge of facial aesthetics, make them suitable candidates for administering these modern injectable therapies.